I managed to squeeze in some gift making before Christmas, and now all the gifts have been given I can show you what I made! I hope Merry Christmases were had by all? John and I had a lovely time, Christmas day at home then a visit to Suffolk to see John's family and then to Surrey where all my family met at my sister's. Today we woke up at home and we started slowly...a nice relaxing breakfast...then a mountain of emails to read through, packages and parcels to wrap and send at the post office and finished off with a little hand sewing & blog writing...it was nice to have a break but equally nice to be back in my paper-and-string world! My shops are definitely remaining OPEN over Christmas and the New Year BUT the amount of days I post parcels will be reduced. 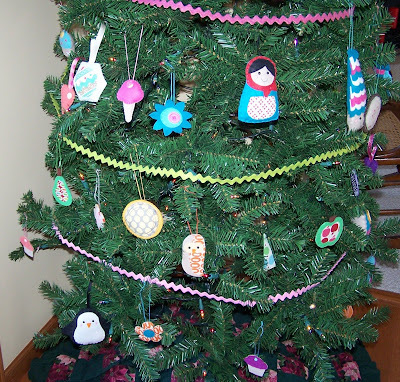 Take a look-ee at this paper-and-string Christmas Tree! 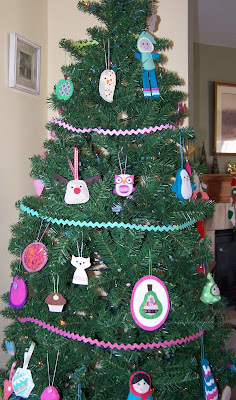 These FAB photos were sent in by an equally FAB customer, isn't that the greatest tree ever? I've managed to *nearly* finish Christmas shopping, *nearly* finish Christmas Gift making...I'm taking lots of photos and will share them in the new year, but I'll be back before then! I have run out of room in the shop section of my workshop. I have new & exciting items that I plan to stock early next year and nowhere to put them. there are so many parcels round here at the moment...lots of parcels of goodies are leaving my workshop packed full of Christmas treats & last minute supplies....parcels are arriving with online Christmas present shopping for my friends & family...and even more parcels are arriving full of scrummy new stock! 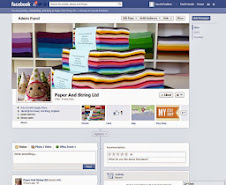 Felt :: 150 more packs of 12" squares, felt to create 30 mini rainbows & fill ups for 24" squares too, phew-ee! If you're waiting on a delivery from me please bear in mind that it's a very busy time of year, I'm still wrapping and packing as fast as I can but then we're at the mercy of the Post Office, and if the daily queues are anything to go by, they are busy!! wow! 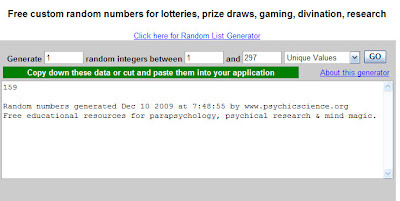 297 people entered my Christmas Freebie! It was such a treat to read all of your lovely comments and I'd like to thank everybody who joined in...hosting a freebie is so much fun! OOOO ! Lovely! Just the thing to settle down to sewing on Christmas Eve! You have been very busy putting all of this together. Don't owls look funny with no beaks??? The freebie is still running...comments will close later tonight and I'll announce the winner in the morning! FREEBIE HAS NOW CLOSED ~ NO MORE ENTRIES ALLOWED !! Yay it's Christmas freebie time! the GRAND prize is a handmade box full of goodies....there will be more about that later! cut out 2 stems, 2 mushroom tops and 5 or 6 little circles for the dots. the hole to get the stuffing in is a little small...the easiest way is to poke it in with a pen! keep adding little bits of stuffing until it's nice and full. Next, stitch the little circles into place, they can go where ever you fancy...using little white buttons would look good too! Start to stitch your red mushroom top together, adding the ribbon and the stem as you sew. 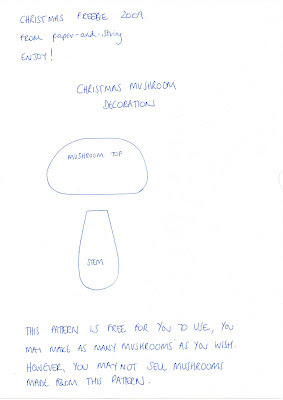 Christmas Mushroom Decoration for everyone! AND a made-by-me Mushroom decoration too! Phew! I don't think anything else will fit in the storage box! It's easy to enter....simply leave a comment on this post and your name will go into the hat! 5. FREEBIE draw is open from Thursday 3rd - Wednesday 9th December. 6. The GRAND prize winner will be announced on Thursday 10th December. Good Luck, and happy mushroom making! I've been featured on Meylah! If you click the link it'll take you to the post...it's worth a scroll down, there are some COOL moustache cups, in amongst some other lovely Handmade Gift Picks. I've spent today preparing for tomorrows freebie extravaganza...there will be a grand prize, and a little something for everyone!! I didn't know what to sew this weekend. I took a pile of felt and my box of patterns home from the workshop and just sat in my sewing armchair and made some of what I fancied! 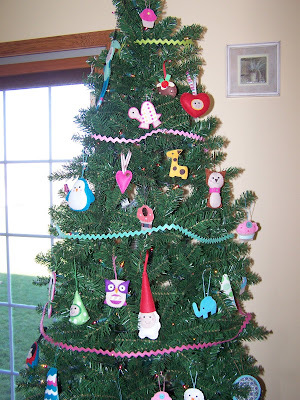 and some plump felt heart ornaments, which I haven't made for ages! all of which will appear in the shop sometime tomorrow. 1. Write a list every day. 2. Use your favourite pen and your best handwriting. 3. Confine each list to two facing pages. 4. Start each new list with yesterdays list of not-finished items. 5. Insure at least 50% of the list consists of fun things to do. 6. Be sure to tick AND cross through each completed item. 6a. Be doubly sure to add something you have just done to the list purely for the purposes of crossing it off. 7. Revel in your list-making.